Left: David Labeda (outgoing Vice-Chairman, Judicial Commission, acting ICSP Executive Board Editorial Secretary and ex-officio Judicial Commission Secretary). 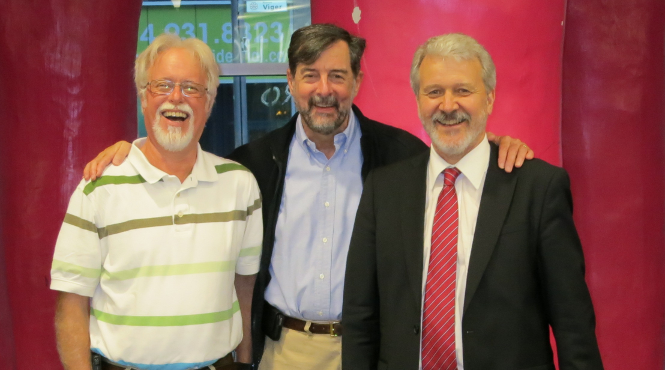 Center: George Garrity (outgoing ICSP Executive Board Chairman). Right: Brian Tindall (Judicial Commission Chairman) at the IUMS Conference, August 1, 2014. George Garrity and Charles Parker will be attending the International Congress of Bacteriology and Applied Microbiology at the IUMS 2014 conference. We will be submitting a draft of the next edition of the International Code of Nomenclature of Prokaryotes. [permalink] Posted September 6, 2014.